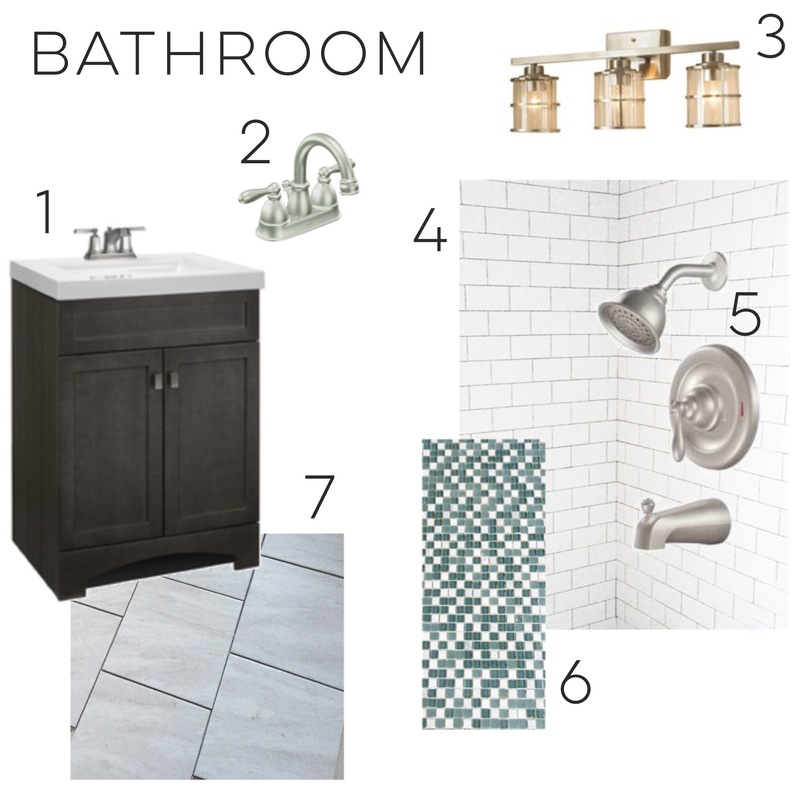 Remember how we redid our half bath? If not, you can check it all out here. If you’ll recall, when we last updated you, we were mirror-less in the half bath. Womp, womp. It was the old mirror from our dining room back in Boston (and apparently it was from Bed Bath & Beyond, although I have a hard time believing I spent that much money on it, but whatever). Anyways, I wasn’t crazy about the black frame. But the shape and size were good, so I figured I’d try my hand at spray-painting it. And just to keep everything neutral, I decided to go with silver. Titanium Silver to be precise. I then proceeded to tape off the mirror with blue painter’s tape . . . I used a bunch of smaller pieces so that I could tuck them in along the curves. Then, I added newspaper to cover the entire mirror so that I wouldn’t end up with paint everywhere. Then the operation moved outside. I set the mirror up on a large broken-down box and got my spray on. Oh, and I also decided I’d spray some old frames while I was at it. Here it is after one coat . . .
After two coats (I started finding frames everywhere and kept adding them in) . . .
And finally after three coats (I had to actually stop and buy another can of spray paint–I really don’t understand how people cover stuff in only two coats using one can? Am I over-doing it or something? What am I missing?) . . . Pretty good, right? And little ol’ naive me then just figured I had to let it all dry, remove the tape, and I’d be good to go, right? So I put it all in the garage to dry for a few days so that it was good and cured. And then I removed the tape. And I guess from a distance it looked okay, but that dang spray paint got everywhere! Including underneath my newspapers. Grrr. So out came the handy-dandy razor . . .
And the spray paint scraped right off. Voila! All that was left was hanging it. Now, in retrospect, I think I hung it too high. That seems a common problem in our house–I think it has something to do with being tall. Oh well, at least it’s up, right? What do you think? It’s an improvement, at least, right? Now our guests won’t be freaking out wondering whether they’ve got boogers hanging out of their noses. You’re welcome guests. You’re welcome. Oh, and in case you’re wondering who’s the fairest of them all, well, it’s this girl. Duh. And what it looks like now . 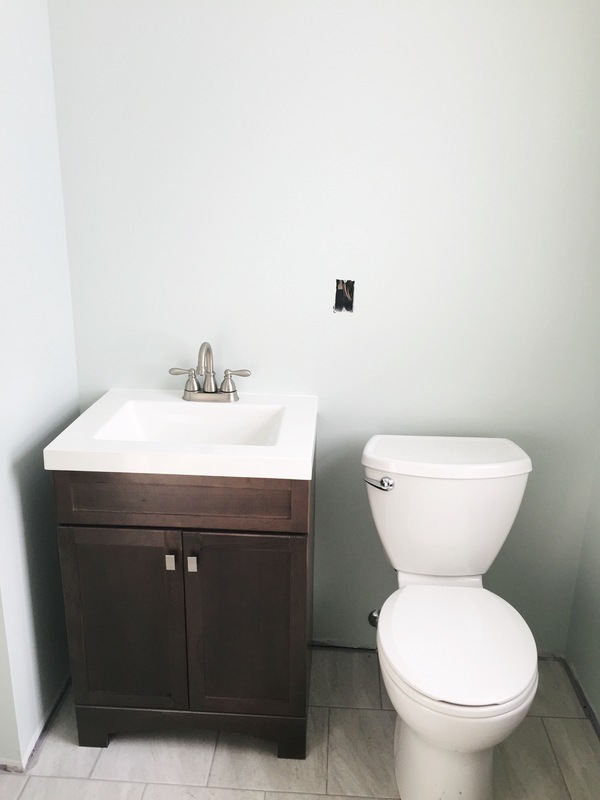 . .
Obviously that’s not where the toilet paper will go–I just still need to install the holder next to the toilet. Oops! The slightly funny thing about this picture is that my bump got in the way . . . Toilet: Already installed here, it’s the Jacuzzi Maxima from Lowe’s for $149. With an American Standard upgraded seat for $35. Sink: The Kraus 19″ ceramic vessel sink combined with a Kraus faucet for $194.95 from Faucet.com (with eBates). 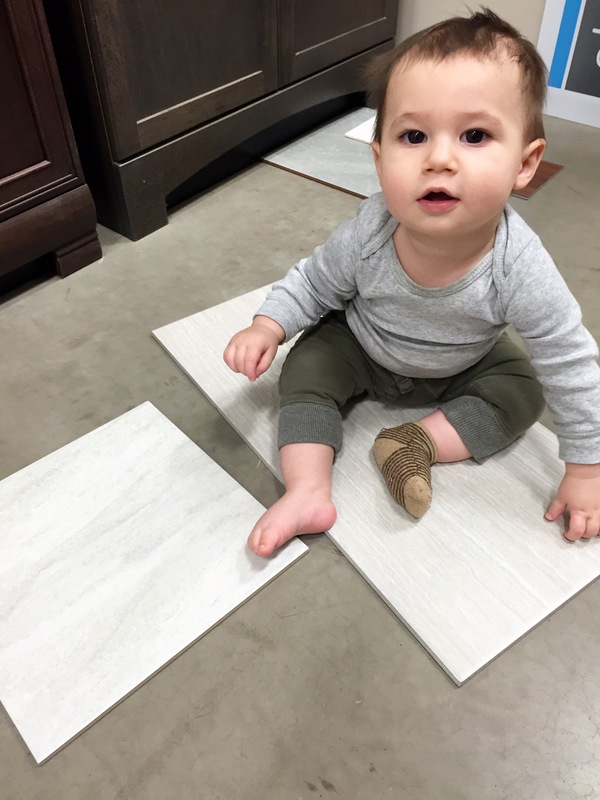 Floor Tiles: White Gloss Penny Tile from the Tile Shop at $4.75 per sf. Grout: Laticrete Sanded Grout in Smoke Grey from Lowe’s (provided by my contractor, but I think it costs ~$11). 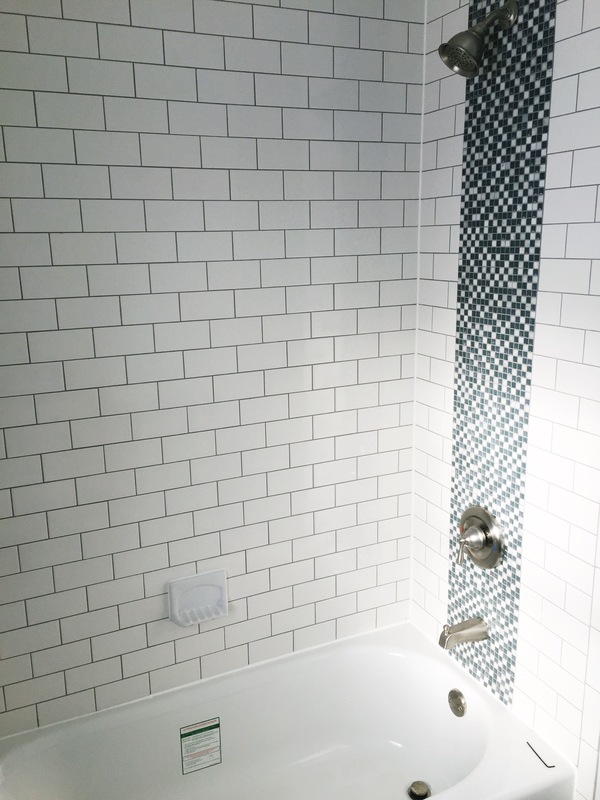 Cove Base Tiles: American Olean 6″x4-1/4″ Bright White ceramic cove base tile from Lowe’s at ~$2.00 each. Vanity Top: Donna Sandra Granite remnant from CFM Stone in Buffalo. All of their remnants are $55/sf installed, so this cost ~$480 total. Vanity Hardware: All from Home Depot, knobs are the Liberty 1-1/2″ Caitlin for $3.99 each; pulls are satin nickel cup pulls (I can’t find them online, but they’re stocked in most Home Depot stores) and they cost ~$4 each. Mirror? Taking suggestions . . . Walls: I chickened out here. Well, not exactly. I just couldn’t make any more decisions, and I wanted everything done. So when the contractor offered to paint the walls after removing the wallpaper, I said yes. And because I couldn’t handle picking a paint color, I went with my tried-and-true favorite (which is also on practically every wall in our house): Benjamin Moore’s Decorator’s White, but in Sherwin Williams’ Duration paint. What do you think? Big improvement? Hopefully I’ll get some after pics of the kitchen taken this weekend so I can share next week (we’re having issues with cabinet hardware, so that’s been the hold-up–sorry!). Is it any surprise that the one-week renovation turned into a three-week job? I guess you could say it was a bit of a surprise to Mr. Bunches and I–we knew not to hold our breaths for completion in a week, but we did (foolishly) think that two weeks was a real possibility. In fact, we were anticipating arriving home this past Monday to a final reveal (akin to Extreme Makeover’s “MOVE THAT BUS!”), but that didn’t happen. No sense whining about it, though, right? Right. 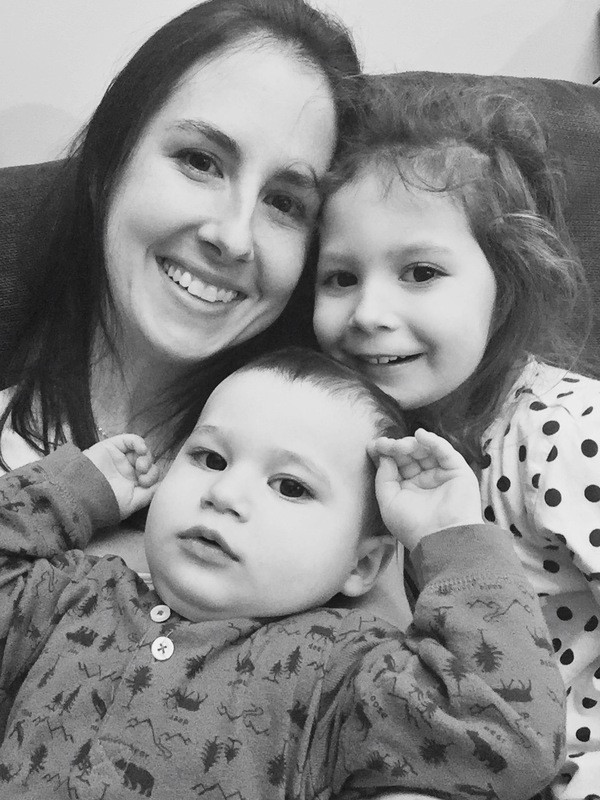 While this week’s earlier post was how we left things looking as of last Thursday (when we headed out of town for a whirlwind east coast tour–more on that later), here’s how things were looking earlier this week . . .
Not too shabby, eh? 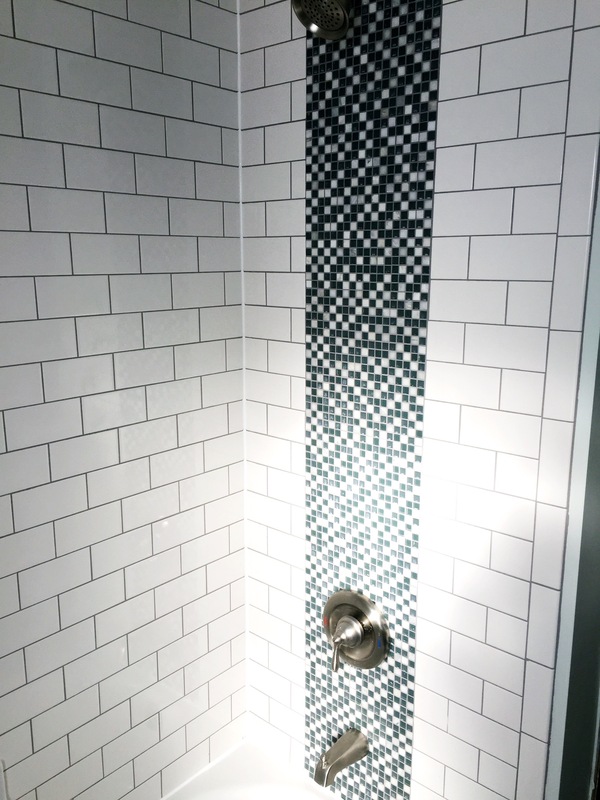 Walls have been painted, pendant lights have been hung, tile backsplash has been grouted, and the ceiling has been patched. We’re loving the stainless steel shelves, and I have to give credit where credit is due: Mr. Bunches picked these out himself. I wanted white wooden shelves, but that would have involved a bit more work on our parts. So thank goodness for Mr. Bunches’ laziness, eh? Er, I mean ingenuity honey :). And how great do the pendant lights look? Keep in mind that all will be better once the trim and cabinets are painted white . . . The laundry room also got a new coat of paint, along with a new laundry sink and faucet. With the removal of the lower cabinets, and the trimming of the upper cabinet, we were able to push the washer/dryer back another 8 inches. Now, that may not seem like much to you, but to me, well, it’s a little bit of laundry heaven. Especially since I’ve grown about 8 inches out front these days . 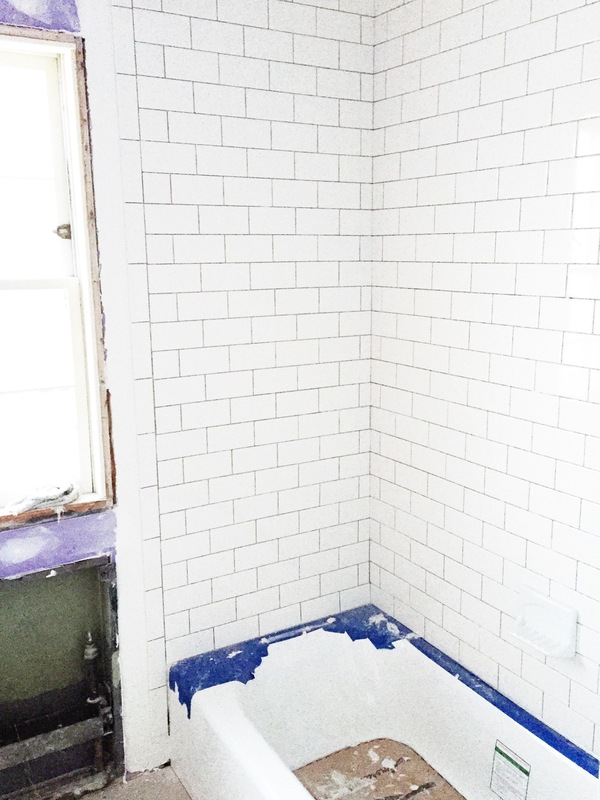 . .
And the half bath also saw progress–the new penny tile floor and cove base was put in and grouted . . .
and the faucet, sink, and placeholders for the pendants were in. Plus, all had been freshened with a bright white coat of paint . . . If all goes well this weekend, we’ll be wrapping this kitchen project up with a bow! Hallelujah. Sorry for the crappy phone pic, but I was a bit distraught at the time. See, the problem was that hood was only 24″ above our cooktop, which meant that it came to my chin. Not cool. Especially since I love to cook. And it was also just a lot bigger than we had thought–we took down all those upper cabinets to open up the kitchen, and now it felt closed off again. So we made the difficult decision–no range hood. And now we’re trying to sell it on craigslist–so if you know of anyone in need of an island range hood, please let us know! 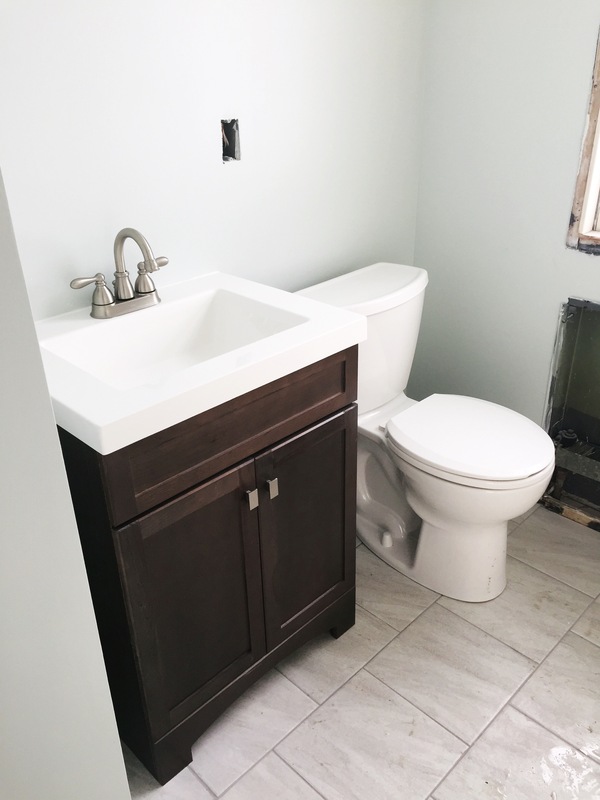 Progress: Countertops, Sinks, and Tiles, Oh My! Just after I posted the last update, sure enough the contractors showed up and actually banged out some pretty serious progress. Guess that’ll show me, huh? Notice anything new . . . ? That’s right! The countertops arrived and have been installed, and they are BEAUTIFUL. If you remember from this post, we went with Silestone quartz countertops, color Niebla, from Home Depot. Home Depot had pretty comparable pricing to Lowe’s Allen & Roth countertops (Allen & Roth is the Lowe’s brand), but the turnaround time was going to be faster with HD, so we went that route. And, as a bonus, we had a 10% off coupon for Lowe’s, which HD happily honored for us. Which meant the original cost of the countertops, $3,156, was knocked down to only $2,840! Yay for coupons, eh? The final price per square foot, installed, was only ~$60. And since quartz countertops are considered a capital improvement, we paid no tax for them (granite is the same, but Corian and other solid surface options are taxable)! We love the new bar overhang, and once we paint the cabinets, we’re sure those brackets will be just about invisible. 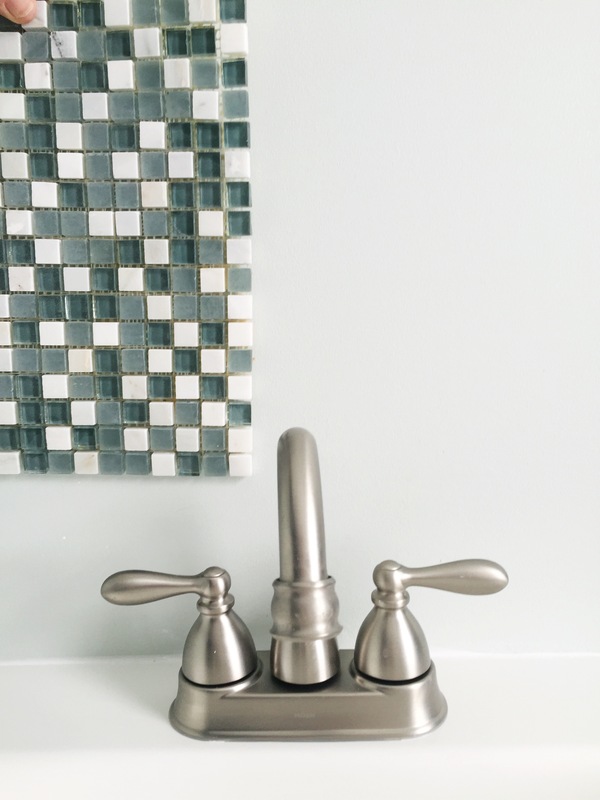 You also can see our new subway tile backsplash in these shots–doesn’t it look great? 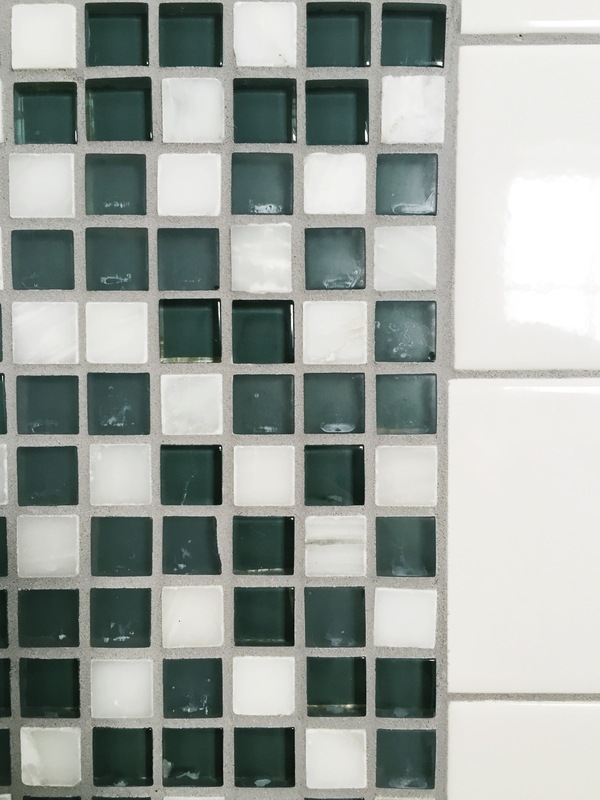 It still needs grout (we opted for white), but we love it. And the new sink is in!!! It’s huge, deep, and exactly what we wanted. You may remember the agonizing sink decision from here. There have also been some other kitchen updates–we had 4 6″ can lights installed. You can see two of them in this shot . . .
That big light in the middle is actually a sun tube. And while it may not be the most aesthetically-pleasing light in the world, we do love that it gives the kitchen a ton of natural light during the day. With four new can lights, and two pendant lights going over the sink, I’ll finally have the bright kitchen I’ve always wanted (there’s nothing quite like cooking in the dark to make you uber-frustrated). 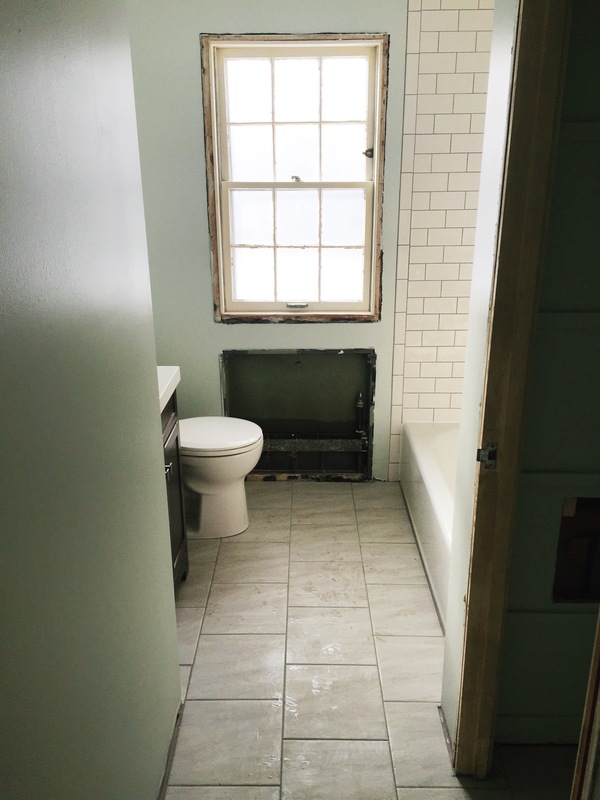 There was also progress made in the half bath . . .
That’s right–the new countertop was installed in there as well. It’s Donna Sandra granite. Looks a little brown/peach in that picture, but trust me–it’s basically all different colors of gray. And the vessel sink is just on there for placement now. Once the walls and cabinetry’s painted, it will look much improved, I promise. Not much has changed in there except for the walls being spackled. In the interests of full disclosure, these pictures were all from last week. 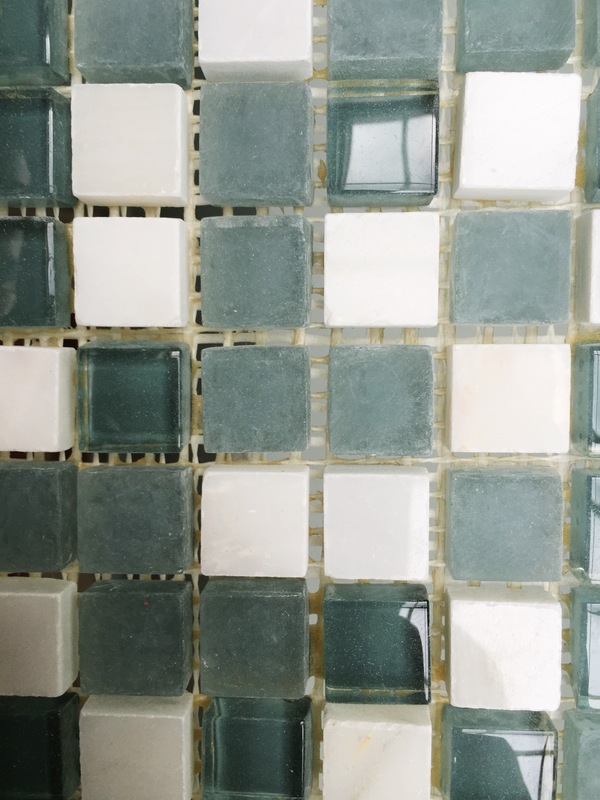 A lot has happened since–more tile, paint, a range hood conundrum, faucets, sinks, etc. I’ll try and get another post up soon so you can see where we really stand at the moment. But, until then, what do you think? Do you love the new countertops? Why is that contractors can’t stay on schedule? Or even work a full 8-hour day? It’s seriously messing with my mind. I feel like I need to start my own contracting firm–just by working a full day and knowing how to use the phone, I would kill it in that business. Un-frickin-believable. Anyways, that’s my little rant. I’m trying to keep calm so as not to rile up Mini B in my belly . . . not sure how well I’m doing though. As you can see, they completed the removal of the ugly light box and then patched the drywall. Not entirely sure why there’s only one electrical cord hanging down as the plan is to put two pendant lights in there, but hopefully that will get resolved. They’ve finished patching all the walls and putting new drywall up. And they’ve also removed the chair rail from one half of the kitchen, and the cove base from the floor . . .
Oh, and I haven’t done an update post on it yet, but obviously from that picture you can tell that stripes won out in this battle. Kind of scary, huh? 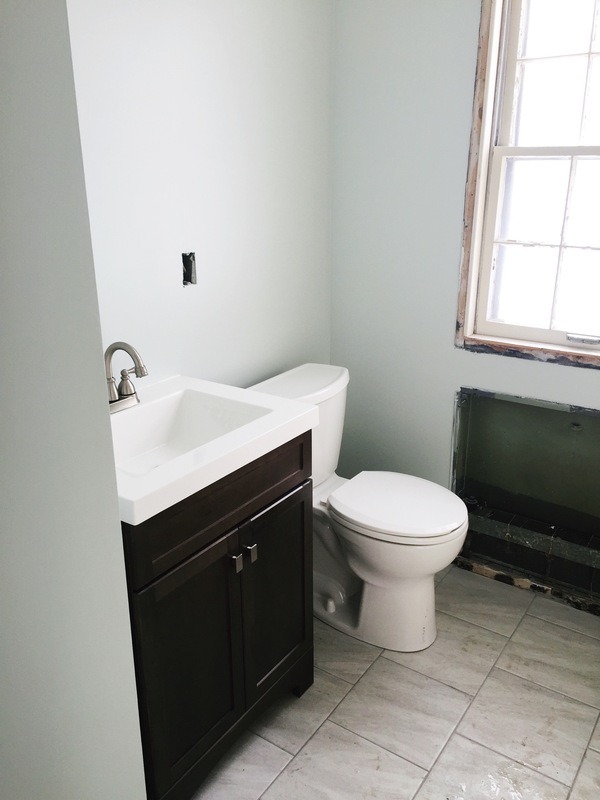 We’ll have a new laundry tub installed, and once the new flooring is added throughout and the walls patched, it’ll look so much more open. Can’t wait. So there you have it, our renovation update. Check out the pile of supplies waiting to go in . . . sinks, tiles, paint, lights. Awesomeness. And in case you were wondering how much snow we got with that big nor’easter they were forecasting, well, let’s just say that I still think the best job ever would be as a meteorologist–I mean, what other job out there exists where you can always be wrong? !